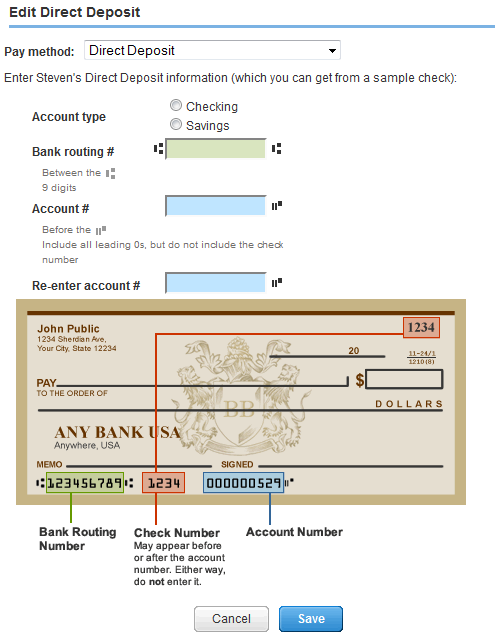 How to set up and edit direct deposit information. Direct deposit is automatically activated in your Intuit Full Service Payroll account when you confirm the test transaction of your company bank account. Once activated, simply enter your employees' direct deposit information and run payroll. See steps below. Click Edit next to Pay Method. Select Direct Deposit from the Pay method drop down arrow. Enter the account type, bank routing number and account number. Note: Routing numbers beginning with '5' cannot be used for direct deposit. These numbers are for deposit slips which are internal routing numbers used only by the bank; If your employee provides you with a routing number beginning with '5' make sure they are getting their info from a personal check and not a deposit slip. For QuickBooks Online Full Service Payroll (QBFSP) see Set up an employee for direct deposit.